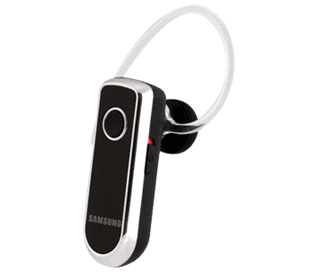 The Samsung WEP570 Bluetooth headset takes a multi-faceted approach to clear communication. WEP570 provides fully-integrated background noise filtering, echo cancellation, and wind noise reduction. In moving vehicles, at noisy restaurants, or on crowded streets ¿ crisp and clear conversations are a reality with this petite headset. The black WEP570 hands-free headset is sleek and lightweight. With comfort in mind, the ear hook can be worn on either ear. Car cradle with USB is included. While in the same feature category as premium-priced Bluetooth headsets, the affordable Samsung WEP570 Bluetooth headset is a tremendous value.